When I was younger I would always apply all kinds of make up using either my hands or the brushes that came included with products but as I got older I started using proper brushes and slowly began to work out the different uses of the brushes. About a year ago I discovered the Real Techniques brushes after seeing a range of YouTubers and bloggers recommending them. It started off with just the 'core collection' and then it grew from thereon. Most recently I've expanded my make up brush collected to include the new and limited edition version of brushes that the Chapman sisters have released. This limited edition set of brushes comes with five brushes in an absolutely gorgeous pattern; black and white brush strokes with pink trims and matching black bristles with white ends. The brushes look stunning and also provide some usually lesser available options including a buffing brush, contour brush, stippling brush, deluxe crease brush and a base shadow brush. My favourite is definitely the deluxe crease brush as it creates the most insane highlight across the face. In all honesty all of these brushes have multiple uses and would work well with all skin types. My skin is very dry and sensitive and I don't find them harsh against the skin at all, the bristles feel very soft and fluffy. Below is a closer look as the brushes as a set outside of the original packaging; against the light backdrop you can really see how the brushes design really pops. These are definitely my new favourite set from the Real Techniques collection. The price point of £24.99 is actually incredible when you consider that for the price you receive five brushes when some of them cost roughly £10 individually; I've always found the Real Techniques brush sets are the best value as you get a lot for your money and they're great quality for the price point, too. As a result of buying another set of brushes it was definitely time to invest in a make up bag just for brushes to use as both storage and also primarily for travelling as it's impossible to fit make up and brushes together in a bag as I have more brushes then I've shown in these pictures. I've had other sets of brushes for months now and I can definitely say that the quality is fantastic, they've lasted so well and look as good as new. I can't say for certain about the Berlin set just yet but I'm sure they'll be just as amazing. I've honestly never had any of the bristles fall out or become damaged either, which is great as these brushes are an investment piece for anyone. It was seriously difficult to choose a make up bag that would work well for holding brushes and I finally settled on one from a brand that I truly love; the latest Cath Kidston collection is spectacularly gorgeous and I eventually settled on a beautiful pink and grey floral pattern in the new style cosmetic pouch which set me back £12. In my opinion it's worth every penny and it's a great statement piece with its rose gold detailing on the zip and edging. The new style also works really well for holding brushes and it is much, roomier than it looks which was a pleasant surprise as I ordered it from online so hadn't seen it beforehand. 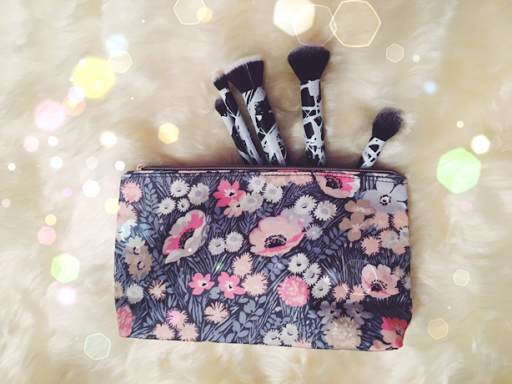 I'm really excited to use these brushes and the make up bag frequently in the coming months.